Daily from 8:00 a.m. to 8:00 p.m.
Parents are encouraged to take part in their child’s care. You may stay overnight and sleep on the sofa in your child’s room for the duration of their stay at the Children’s. Each in-patient floor has a family room for you and other family members to use while visiting your child. The rooms have a kitchenette, appliances, and lounge chairs. If you come to the hospital after 8:00 p.m., Security staff will ask you for identification. This is done for the safety of all hospitalized children to make sure only staff, patients and parents are in the hospital overnight. If you or other family members from out of town need a place to stay, Social Services (ext. 24455) can provide information about hotels near the Montreal Children’s Hospital. A maximum of four people can visit your child at any given time. If your child is in one of the intensive care units, the maximum number of visitors is two people at any given time. In general, children under 12 years old may visit a patient but they must be accompanied by a parent. 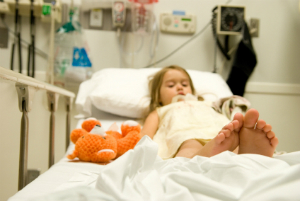 Ask your child’s nurse if visitors under the age of 12 are allowed to visit your child. Do you have a cold or the sniffles? Parents, family members and friends should not visit the hospital if they are suffering from a cold, flu, any other viruses, or if they have been in contact with any infectious diseases such as chicken pox or measles. If you are not feeling well, please postpone your visit until you feel better.